Written by Bart Armstrong, Victoria B.C. Most Canadians, and indeed all North Americans have probably never heard of the little hamlet called Youngsville in what was then called Canada West (Ontario). Located in the Township of Zorra, within Oxford County this community was settled by strong, community-minded United Empire Loyalists and ancestors to many who are honoured to join with you today. Youngsville was founded in 1830 when approximately 1000 acres of land at a crossroads were purchased by Gabriel Youngs and cleared and settled by many of his sons. This land would soon house a hotel that would, for a period host the local council meetings and a post office. On this land were soon built a cider mill, blacksmith shop, carriage-works and many dwellings. Later a school would be built on these same lands. It and the hotel would stand for over 100 years. Benjamin, named after his great grandfather, would be born and raised on a farm just a few miles north of Youngsville in a community called Brooksdale. In youth, he found work as a carpenter. In either 1862 or 1863 BF was possibly living in the Dearbonville area of Michigan State (now known as Dearborn). On September 1, 1863 the 19 yr old teenager had done what some 50,000 other Canadians had done. He had signed up for service in the Civil War by joining the army with an enlistment at Detroit, about 7 miles east of Dearbonville. Within days he was mustered into the First Michigan Volunteer Sharpshooters, a perfect fit as the teen was a known crackshot back on the family farm. He’d get a $25 bounty for enrolling. Ten days before his next birthday, and within 10 months of enlistment, Benjamin Franklin Youngs would become an American war hero. But much less dramatic, his army service would start out with the Sharpshooters playing the roll of guards at Camp Douglas located in Chicago. Part of the 80 acre complex would in later days become home for the first location of the University of Chicago. Condominiums sit on part of the site today. The Camp would first house about 7,000 Confederate POW’s from Fort Donelson in Feb of 1862. (A Medal of Honor would be issued to a Northern sailor for action at Donelson, and who would later live and raise a family at Halifax NS for over 3 decades.) Before being closed down the camp would have housed over 20,000 POW’s, as much as 12,000 at one point. Camp Douglas would eventually become known as the “Andersonville of the North” for it’s inhumane conditions and would see the deaths of over 1,500 before being closed down. It appears that the first 8 months of BF’s short 13 month Civil War career was spent guarding at Camp Douglas. After just three months he was promoted to Cpl. One hopes it was not for the type of treatment it seems was a daily event at this horrible camp. Comparing portions of his archived service records to the Sharpshooters history reveals that Cpl. Benjamin Franklin Youngs was probably present during the battles at The Wilderness, NY and Po Rivers and at Spotsylvania, all in Va, and the last being where he received the first of at least two.. if not three wounds. Hospitalized for 6 days, BF would then return to his unit and probably the battles at North Anna, Totopotomoy Creek, Bethesda Church and Cold Harbor, still all within the state of Va. He and his unit then participated on the advance on Richmond and the engagement of several skirmishes or battles en-route in the Petersburg Campaign. It would be here at an assault on the Confederate works that Cpl Youngs would capture the colors of the 35th North Carolina Infantry, C.S.A. When the unit drove back the Confederate unit into its entrenchment, Youngs jumped into the trench and seized the colors. These were immediately carried back to friendly lines and Youngs escorted the colors with others who escorted many POW’s back to the HQ of the next higher authority, that of the 9th Corps, Army of the Potomac, where all were presented to the general in charge. In reward for gallantry in the field and capturing the enemy’s flag, the General promoted Youngs on the spot to the rank of Sergeant. His name was also forwarded up the line and cited for gallantry and no doubt the Medal of Honor. Years later the story became accepted that Youngs did not capture the flag, but was in fact ordered by his Captain to seize it from the enemy after a Private in the regiment had pointed a bayonet to the Southerner’s throat. The Captain was then himself injured and spent weeks elsewhere recovering. 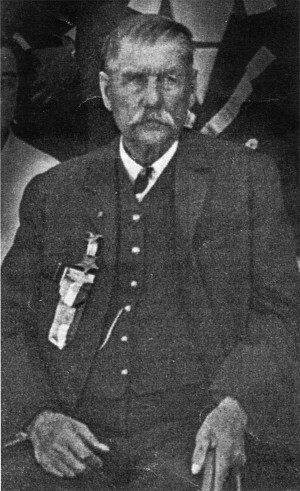 Upon return to the regiment the officer became quite upset at learning of the Youngs promotion and recommendation for the Medal of Honor. He was so infuriated at Youngs who apparently gave no credit whatsoever to the Private, that the Captain demoted him back to Cpl. The demotion was overruled when the matter was brought before the general. Letters written by the Captain some 15 years later and to higher authorities continued to advance the Captain’s views that Youngs did not deserve the medal. Many decades later these letters would resurface when being quoted by the author in a very detailed history of the First Michigan Sharpshooters Volunteer Infantry Regiment. However a completely different view is painted by one affidavit and several sworn testimonials taken, under oath and in writing, made just days after the event. Documents held by the US National Archives. Several privates, two Lieutenants and a Captain all provided evidence to higher authority that it was indeed Youngs who captured the flag. These testimonials gave no mention whatsoever of a private holding a bayonet to the Southerners throat, nor evidence to the Captain being on the spot, let alone ordering Youngs into action. Unfortunately, these letters nor their content are not widely circulated. Thus, the apparent erroneous claims made of Youngs lack of a qualification for the medal, are all that most learn about the matter. Within days of the Petersburg flag capturing, Youngs found himself in hospital re-cooperating from another wound. A month later it is believed that Youngs participated in the horrific slaughter on both sides at the Battle of the Crater. After several attempts at the Union’s making headway and being push back, one of the regiments had an interesting idea. Why not dig a tunnel under the enemy fort and just blow it up? The unit, consisting of miners in pre war days, was given the go ahead and for several weeks dug forward over 500 ft, and then to left and right about another 75”, all being about 50’ below ground level. Then about 8,000 pounds of gunpowder were placed at the centre of the T structure and at both ends. Each of the 3 points being below heavy enemy gun positions directly above. About 350 Confederates were killed within seconds when the mine was blown. The thunder was felt in the Confederate capital of Richmond. By days end over 5,000 men would either have been killed, wounded, missing in action or taken prisoner of war. Enemy losses were less than the Union for several reasons. After the explosion a massive crater was formed, still in existence today. It measured about 170 “ by 80” and about 30’ deep. Battle plans were changed at the last moment and untrained troops were the first ordered into the pit, with many units following. None were told what to do once they got there. It didn’t help much that the commander.. a general… was off getting drunk when the mine was blown. Mass confusion followed. Making matters worse, the walls of the crater became so unstable that the men could not climb out. The Confederates were quick to bring up reinforcements and take advantage of the situation. They simply took positions along part of the edge, then took their shots at the Union soldiers, sitting ducks that they were. The records show that Youngs was with his unit at this time and so it is assumed he was also in the midst of this catastrophe. He also fought during the Battle of Weldon Railroad just a few weeks later and would be listed there as missing in action. It was later realized that he had been captured and became a POW. He would be held by the Confederates at Richmond, then Varina Va and finally at Camp Parole at Annapolis Maryland. On either 4 or 20 Oct 1864 BF was released from Confederate hands, given a 20 day furlough and sent on his way home to either Michigan, per his personnel file, or possibly back to Brooksdale Ontario where he still had family. (A few miles north of Youngsville). He never returned to service, and on 15 November 1864 was listed on the Sharpshooters company rolls as being a deserter. Most curiously, one of the documents in a file held by the descendants of BF is a letter dated Nov. 23, 1864. It is a letter from the War Department and initialled by the sender with the initials E.D.T. and titled Assistant Adjutant General. At the time the position was occupied by Edward David Townsend, the very man playing a critical role in the creation of the Medal in the early days of the war. The letter announced that a Medal of Honor had been awarded, and that the recipient ought to find it enclosed with the request that it’s receipt be acknowledged. This is curious since only weeks earlier BF Youngs was listed as being a deserter and deserters in those days were not given the Medal of Honor. If so awarded, they were later rescinded. Recognized MOH research resources also note in some cases that the date of awarding of the medal to Youngs is unknown. Others list a date of Dec 1 1864. Yet this document seems to suggest, by its wording, that Youngs had already been communicated with about the award, and reasons thereof, and that this letter was simply a letter of transmission of the medal with acknowledgement requested. Thus the date of the award would have been even earlier than 23 November 1864. As this letter was un-addressed, it is unknown if the medal was sent to him at Michigan or in Canada. By 1871 the Ontario census covering the West Zorra area had listed Benjamin, now back in home territory, married and living with two children ages 2 and 1. BF’s family would grow to 6 boys and 2 girls by 1879, with one appearing to have died in infancy. Benjamin was listed as being in the house carpentry business and his sons followed in his footsteps, one going on to actually building the city hall at Stratford Ont. While one daughter still lived with her mother in Ontario in 1901, a US census for the area of Brockway, Saint Clair County Michigan had BF listed as being a carpenter living on a farm in the area. The record also showed that he had by then been living in the US since 1897. By 1913 it is believed that he was living in La. California close to either a brother or son, both named Theodore. In as much as family descendants today have two Medals of Honor inscribed to BF, it seems obvious that an earlier one was already issued... perhaps back in 1864 as the earlier document suggested. One of the two medals is clearly the Civil War model of army Medal. A second would have been presented when the Gillespie model of the medal was created and issued in 1896. Perhaps it was this later model that he received in 1913. A picture of BF and wife Margaret, held by the family and mislabelled as being taken in the late 1920’s ( both died in 1927), shows Benjamin wearing what appears to be the Grand Army of the republic membership medal. Upon very close inspection of an enlarged copy of the picture, it appears that BF may also be wearing his CW type of Medal of Honor around his neck. On March 4 1925 the US Congress passed an…”Act For the Relief of Benjamin F. Youngs.” In this legislation the Congress acknowledged BF’s rank as a Sergeant and that he was from that day forth to be documented as having been released honorably. The Congress also noted his entitled from then on to any benefits other honorably released soldiers enjoyed. Days later BF applied for an Invalid Pension with application # 1517312 and it was granted with certificate 1268089 on April 7 of that year. Shortly after his death in 1927, his wife Margaret applied for a Widow’s Pension with application # 1573041 and it was soon granted with certificate # 102228, but she also was to soon die, and before the year was out was buried beside her husband, a son Theodore, and in 1953 the three would be joined by a second son Arthur. All being buried in a family plot at Odd Fellows Cemetery at Los Angeles. Benjamin’s first Medal of Honor was issued with the surname Young instead of Youngs. The second (replacement) medal was issued with the correct spelling. Unfortunately today’s MOH reference materials often still list him under the misspelled name. Please visit http://www.canadianmedalofhonor.com/ to learn more about Canadians who were recognized as recipients of the Medal of Honor.